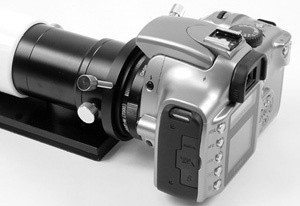 This Mitsuboshi camera interface system allows the precision of knife-edge focusing to be applied to virtually any type of prime focus imager including CCD, film, or digital SLR camera systems as well as adding the flexibility of allowing the camera to be rotated for best framing of the shot. The metric M57 interfaces allow the system to work with a wide range of telescope systems, directly coupling to Borg telescopes or to Vixen and Takahashi scopes via Borg adapters. Other brands of scopes can be coupled via Borg 2" or T-thread interfaces. The key components are M57 Taper Ring (M57TR), shown at right (top), and mating part M57 Taper Holder (M57TH), shown at right (bottom). 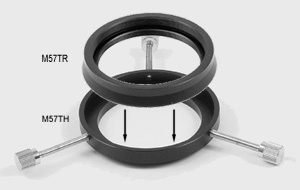 The taper holder is attached to the telescope, while two taper rings are used -- one to attach to the KEF, and one to attach to the imager assembly. The taper ring connection allows for quick disconnection and precise reconnection of mating assemblies as well as for camera rotation for best composition of the image. 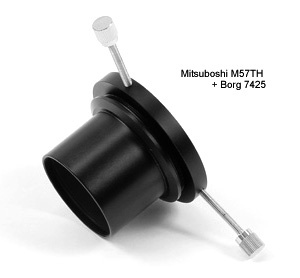 In addition, the M57TR component incorporates an integral 52mm filter holder. (A) Mini Borg scope with taper holder (M57TH) attached. (B) Taper ring with 52mm filter installed, followed by Mini Borg 0.85x reducer (#7885) and Borg Canon mount adapter (#5005). Takahashi: Borg adapters #7910, #7911, or #7912. Meade or Celestron SCT: Borg adapters #7424. Generic 2" eyepiece holder: #7425 (right). Connection of the imager is also done on the taper ring side using an adapter to the appropriate Borg camera coupler. For CCD imagers or digital SLR cameras which have small imaging sensors, a Borg reducer (#7885 for Mini Borg scopes, #7785 for Borg Series 80 scopes) can also be used to maximize the field of view captured by the sensor.